This course which runs over 9 months with 3 modules is for anyone who wishes to explore the practice of Iyengar Yoga. It offers a focused and individualised series of workshops with experienced teachers who will guide you step by step through the practice of asana and pranayama, and includes a selection from complementary sessions introducing the Yoga Sutras, Philosophy, Ayurveda and Sanskrit. 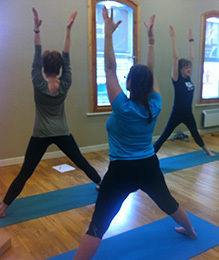 For those who want to develop their yoga practice or possibly are considering undertaking an Iyengar teacher training course, this course offers a unique experience in a specialised yoga studio to enhance your personal practice and to gauge the commitment required from a programme of intensive training. Certificates of attendance and completion will be awarded by iYOGA Dublin to participants signifying their genuine commitment in the practice of Iyengar yoga. What past participants say …..